Looking to play in a Men's C / D Tournament this May? 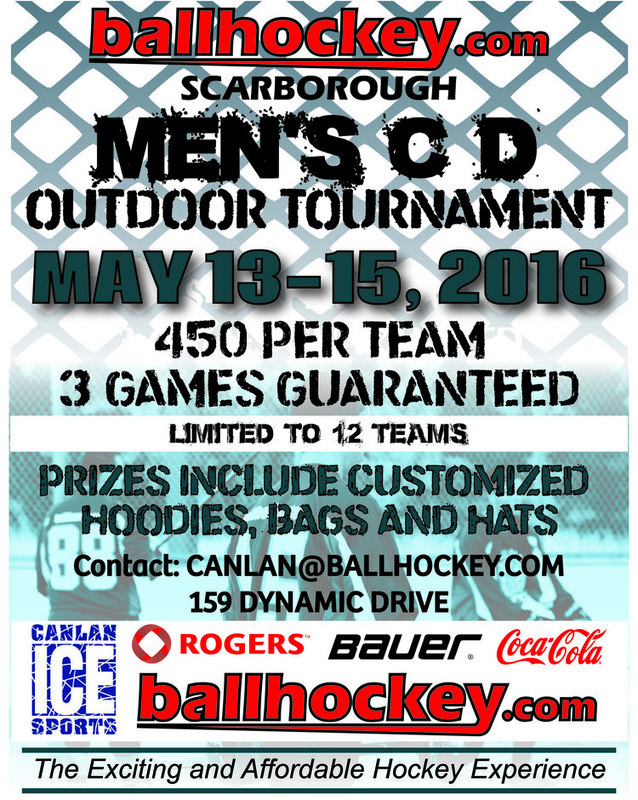 You won't want to miss this outdoor tournament being hosted by ballhockey.com at Canlan Ice Sports Complex. Full details below or email canlan@ballhockey.com to get registered! Corey Groulx, General Manager of the Canlan Ice Sports - Scarborough & Victoria Park locations and Brian Broley, President\CEO of Ballhockey.com Inc. are pleased to announce a working partnership to grow the outdoor game in Scarborough and the surrounding community at Canlan’s outdoor sport court located at 159 Dynamic Drive in Scarborough. Broley indicated “Canlan is the leader in North America in the development & operation of multi-purpose recreational facilities and we are pleased to have the opportunity in this working partnership to expand our footprint and assist in developing the game in Scarborough. We are very excited to partner with Canlan and believe in their slogan “Where the experience is everything””. Groulx added that “Ballhockey.com has shown to be a tremendous sport operator and has a number of multi- purpose recreational locations in Ontario. Canlan is excited to support their efforts to grow the game and is looking forward to this new sports relationship. Ballhockey.com is providing many in the community with the “exciting and affordable hockey experience” and should fit well into our culture”. League Activity will begin June 1st, with a summer season running June/July/August. Men’s B, C and D leagues as well as Women’s & Youth leagues will be offered. People can join individually and be placed on a team, or can enter as a team. More information will become available on www.ballhockey.com as we launch. We will be seeking league and activity conveners as well as Officials and Timekeepers to assist us in the Scarborough club. Contact Brian Broley for more information. Ballhockey.com provides the sport with International, National and Regional events to compete in as well as operating multiple locations in the Province of Ontario and Partnering with Cool Hockey Events in the USA to run major events in North America. Canlan Ice Sports Corp is the North American leader in the development, operations and ownership of multi- purpose recreation and entertainment facilities. They are the largest private sector owner and operator of recreational ice sports facilities in North America.